I’m finding this a hard review to write because I’m very conflicted about this book. 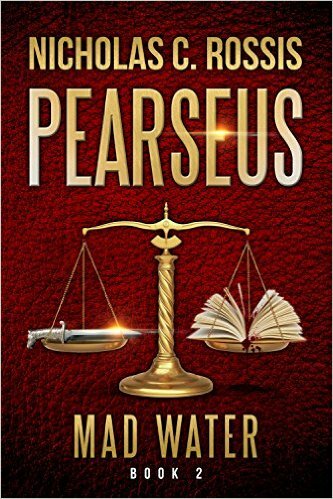 It is a sequel to the very good Pearseus, Rise of the Prince which I reviewed a while back. I can’t say much about what happens as I don’t want to give any spoilers but it continues where the last book left off. It’s a very well written book, no plot jumps like his last one. The plot is excellent, things that where only briefly mentioned in the first come to the forefront in this one. There is a lot more depth and background and you feel you get an understanding of the complicated happenings in this world. Some of the characters are brilliant, Cyrus particularly, but there are many other well written and believable people in it. The ones we meet in the first book have developed and changed as people, the events of the past book have changed them all. Well I hate to say it but I didn’t like the book, it was very well written and a good story but a tad depressing, I couldn’t really root for anyone. I may have enjoyed it more if I had been in a better mood, maybe I should have read a more uplifting one. I found my self getting angry with most of the choices the characters made, which is a sign of a very good book, just didn’t help me enjoy it. The other complaint I have I did find Teo Altman a bit cartoonish. I liked his character in the first but found him a bit lacking in depth in this one. A very well written book with a detailed plot and excellent characters, just don’t read it if you are feeling a bit down! I’m going to read the next one in the series maybe that will cheer me up a bit. I’m giving it 4.5 starts again just because I’m being miserable doesn’t deter from the fact it is a good book. I actually wrote this review a few weeks ago I’m just reading it again now and although I haven’t changed my view on the book I hope I am not being unfair to the author as it is very well written. It would be great to hear from people who loved the book, I’m sure there are lots of you! If you haven’t read it yet go and read the first in the series. I’m glad you are ok with it, I nearly didn’t post it as I didn’t think I was being fair. Do you want it on amazon? Before you said that I was looking forward to reading it, now even more so.